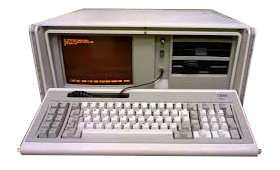 It’s 1984: One year after Compaq market entry with its own portable, IBM was forced to draw along to keep their market share. So they shed the light on the IBM PC portable, an luggable computer built on the XT basis. With strong competor Compaq running after IBM’s market share, Big Blue was more or less forced to devise a portable computer of their own. When the IBM PC portable was finally released, a year after Compaq had released their own, it was generally considered less innovative than it’s competitor: It was equipped with one or two DD 5.25 floppy drivers, up to 512 KiB of RAM and a 9″ amber monochrome CRT driven by a standard CGA video board. The PC portable is … well … portable. As far as it goes, with the built-in monitor and keyboard, it offered all the essentials. At over 15 kilogramms, it can be bulked around using the integrated handle on the back, but it was definitely to no good “mobile” use as it didn’t include a battery option. In essence that meant to always run the PC portable from mains power. Yet, the PC portable didn’t offer anything new at all. Essentially, this was a disguised IBM PC XT, even the very same mainboard of the desktop companion, sqeezed into a carry-case. Owing to the space constraints imposed by the built-in floppy drives and the CRT screen, the 8 ISA expansion where of reduced use, as many cards couldn’t be properly fitter. Back in the early 80s, portability meant exactly what was offered here: Desktop technology built into a carry-case. But it wouldn’t take long for portable computers becoming smaller and better integrated. Ten years after the IBM PC portable, a typical notebook computer would be a tenth of it’s size, a sixth of it’s weight, and 100 times more performent.